China According to Brad: Homemade Tradition Dumplings! 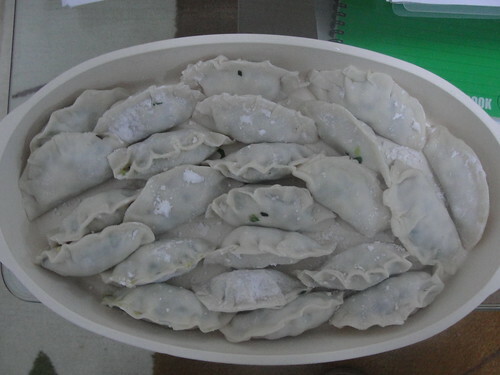 Last night I got the privileged of Lindon's (my boss) Mother making me homemade tradition dumplings! She even made them vegetarian for me! These ones have egg, chives, and bamboo shoots in them. They do NOT taste like dumplings I have ever had before, but they are fantastic! They also taught me how to make a dipping sauce out of garlic, soy sauces, and some magical ingredient I have never seen before. I also made an "Asian" stir fry to go with it that complimented it pretty well. Onions peppers and snow peas in a soy, lemon, and honey sauce all served over rice. The vegstables here all come from the market next door and are always fresh and delicious. It came out pretty well and I was happy with it. I will have to ask her to show me how to make them sometime. It is Time to go Back!